On 29 July 2017 a group of Tauiwi Treaty workers from across the country met to develop strategies for helping Tauiwi engage with the report, Matike Mai Aotearoa. Tauiwi engage with Matike Mai Aotearoa is the Record of the proposals put forward by participants at the 29 July Workshop Development Day. 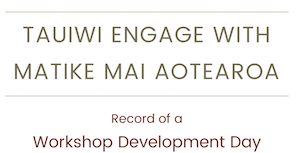 Click on the image to download a copy of Tauiwi engage with Matike Mai Aotearoa.